There is nothing unusual about a Naval hero being inspired by another veteran of the sea. Unless of course you are a Naval Officer as well as a junior vice-president for Standard Oil and the source of your inspiration is Popeye the Sailor Man. 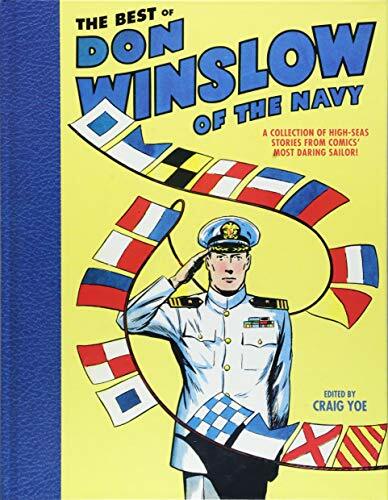 In a graceless time that finds The White House unable to decide if a Senator who served his country proudly for decades in both war and peace deserves have the flag of The United States of America flown at half-mast, we need the dignity and oddly enduring values found in Don Winslow of the navy. The straight-forward and respectful depiction of the navy in these stories is enduring in a wonderfully heart-warming way. Still, make no mistake about it, Don Winslow, in comic book form, is as close to thrilling pure pulp adventure packed with action as the comic book medium field can get. But at the end of each adventure, you are filled with the idea that these stories, for all their disposable nature, do mean something important. That each one silently represents the ideals of an America united, centered in its being, proud of the way its citizens contribute something positive to the core of the country. It’s a sense of togetherness and purpose that America lost around the time of helicopters being pushed in the South China Sea while college students were building bombs in the basement of their campus dorms. Over the last few decades it has been easy to laugh at the simple and straight-forward patriotic fervor, that sense of positivity found in doing the right thing found in this collection of stories mostly set in World War II. It’s that positivity, coupled with a true sense of adventure, that helped turn Don Winslow into one of the most successful newspaper comic strips of all time. From Big Little Books to Movie Serials to clubs, decoder rings, radio and pajamas, Don Winslow was one of popular and well-marketed characters of its day. Don Winslow was the deliberate creation of Lt. Cdr. Frank Victor Martinek, USNR. A veteran who had not only received the U.S. Victory Medal but, during the early part of the 20th century had also been decorated by Czechoslovakia and Russia! By the time of the early thirties he was a Reserve Officer and had even added a few years as a G-Man to his resume. In 1933 Martinek, by then working on publicity and recruitment for a civilian part of the navy, was reading a Popeye strip in the daily newspaper. The idea grew that a regular, everyday naval hero could be appearing in the same format and have the same influence that the spinach-gobbling, squinty-eyed friend of Segar did. Martinek saw that the strip could also serve as both a propaganda and a marketing tool that would hopefully catch the eye of hard-to-get recruits who lived in the land-locked Midwest. The new newspaper strip debuted in 1934. As opposed to most strips, each often the creation of a single entity, Don Winslow was a group effort as artists and writers were recruited to bring Martinek’s idea to life. Don Winslow was a late arrival in the comic book field. Published by Fawcett, the character, already long established in the public’s eye, debuted standing on the cover of his first issue next to the most popular character of the day, Captain Marvel. Which was only natural as Don Winslow was now being published by the company that was responsible for The Big Red Cheese, Fawcett. In business since 1919, Fawcett recruited artists from sweat shops that served the publishers. This includes Edd Ashe and Al Fagaly who, by most recollections and research, did a good majority of the work on the Winslow title. Bolstered by both a strong presence on screen and on the radio, the Winslow book, while never a big hit, served its purpose well. It created a sense of adventure and portrayed the navy as a gloriously noble and strong organization. It is easy to read one of these fun-filled slugfests and picture a kid sitting behind the barn in Idaho getting up filled with the sudden desire to see the South Seas. In some ways Winslow is actually a prototype for the James Bond figure that arrives two decades later. He is an Intelligence officer who travels the world skinning, shooting, kissing and fighting the bad guys. The adventures are a positive and popular reflection of the nature of the war years in America. The adventure never stops and the socks to the jaw are as hard as a smack from a detective in a Dashiell Hammet novel, while the trucks drive even faster than they do in a Warner Brothers black and white crime flick. The stories collected here reflect the values and standards of the Second World War. The enemy is occasionally portrayed in the racist, buck-toothed manner of the day. The resolution to Amazon Island is so sophomorically misogynistic in its ending that it becomes a sitcom punchline. Yoe Studio, long respected for its strong reprint series of horror, romance, and children’s comics from across the ages, as well as classic works such as early Archie and fifties-era Popeye, has partnered with Dead Reckoning, an imprint of the Naval Institute Press on this collection. With each new publication Yoe Studio broadens the understanding of comic history and often makes you smile as well with their brilliant choices. These are classic adventure tales from a time when both a nine year old and a retired general could feel proud of the way their country conducted itself around the world.